王海宁, 姜晓东, 邓登, 吴旭干, 王少兵, 成永旭. 野生和野生亲本子一代大眼幼体在扣蟹阶段养殖性能的比较[J]. 上海海洋大学学报, 2019, 28(1): 67-74. WANG Haining, JIANG Xiaodong, DENG Deng, WU Xugan, WANG Shaobing, CHENG Yongxu. Evaluation of culture performance of wild megalopae and offspring of wild broodstock of Chinese mitten crab Eriocheir sinensis during juvenile culture stage[J]. Journal of Shanghai Ocean University, 2019, 28(1): 67-74. 王武, 王成辉, 马旭洲. 河蟹生态养殖[M]. 2版. 北京: 中国农业出版社, 2013: 59-84. WANG W, WANG C H, MA X Z. Ecological culture of Chinese mitten crab aquaculture[M]. 2nd ed. Beijing: Chinese Agricultural Press, 2013: 59-84. 农业部渔业渔政管理局. 中国渔业统计年鉴[M]. 北京: 中国农业出版社, 2018: 44-54. Bureau of Fisheries, Ministry of Agriculture, PRC. China fishery statistical yearbook[M]. Beijing: China Agriculture Press, 2018: 44-54. 王怡平, 赵乃刚. 中国的河蟹养殖及其发展前景[J]. 水生生物学报, 1999, 23(6): 735-740. WANG Y P, ZHAO N G. The culture of Chinese mitten crab and the prospect of its development[J]. Acta Hydrobiological Sinica, 1999, 23(6): 735-740. 顾孝连, 乔振国. 我国蟹类土池育苗技术研究进展[J]. 海洋渔业, 2012, 34(1): 110-116. 姜晓东, 吴旭干, 刘青, 等. 长江野生和池塘养殖河蟹(Eriocheir sinensis)蟹种早期养殖性能、抗病力和非特异性免疫性能的比较[J]. 渔业科学进展, 2016, 37(6): 131-137. JIANG X D, WU X G, LIU Q, et al. Comparison of the early culture performance, the disease resistance, and the non-specific immunity between wild-caught and pond-reared juvenile Chinese mitten crab Eriocheir sinensis[J]. Progress in Fishery Sciences, 2016, 37(6): 131-137. 何杰, 吴旭干, 姜晓东, 等. 野生和人工繁育大眼幼体在成蟹阶段的养殖性能比较[J]. 上海海洋大学学报, 2015, 24(1): 60-67. HE J, WU X G, JIANG X D, et al. Comparison of the culture performance of wild-caught and artifical breeding Chinese mitten crab megalopae reared in the grow-out ponds during the adult Eriocheir sinensis culture stage[J]. Journal of Shanghai Ocean University, 2015, 24(1): 60-67. 张列士, 李军. 河蟹增养殖技术[M]. 北京: 金盾出版社, 2002: 5-248. ZHANG L S, LI J. Crab breeding technology[M]. Beijing: Jindun Press, 2002: 5-248. 万全, 苏时萍, 马浩强, 等. 长江野生中华绒螯蟹育苗性能的初步研究[J]. 安徽农业大学学报, 2013, 40(3): 406-410. WAN Q, SU S P, MA H Q, et al. Preliminary study on the breeding performance for wild Yangtze River brood stocks of Chinese mitten crab[J]. Journal of Anhui Agricultural University, 2013, 40(3): 406-410. 张列士, 徐琴英. 自然及养殖水体河蟹性成熟和性早熟的研究[J]. 水产科技情报, 2001, 28(3): 106-111. RACOTTA I S, PALACIOS E, IBARRA A M. Shrimp larval quality in relation to broodstock condition[J]. Aquaculture, 2003, 227(1/4): 107-130. 茅海成, 王高龙, 杨永超, 等. 中华绒螯蟹不同规格亲蟹池塘生态育苗效果的生产性评估[J]. 水产科技情报, 2014, 41(5): 233-236. MAO H C, WANG G L, YANG Y C, et al. Productive evaluation of ecological breeding effect of different size crab ponds in Eriocheir sinensis[J]. Fisheries Science & Technology Information, 2014, 41(5): 233-236. 王亚威, 姜晓东, 吴旭干, 等. 中华绒螯蟹二龄早熟和晚熟群体选育第三代在扣蟹阶段的养殖性能评价[J]. 上海海洋大学学报, 2016, 25(5): 668-674. WANG Y W, JIANG X D, WU X G, et al. The evaluation of culture performance of the second-year early-maturing and late-maturing strains of the third selective generation during the juvenile culture of Chinese mitten crab (Eriocheir sinensis)[J]. Journal of Shanghai Ocean University, 2016, 25(5): 668-674. 韦众, 鲍传和. 池塘养殖与湖泊放流河蟹的性腺肝脏指数比较[J]. 淡水渔业, 1999, 29(9): 16-17. 陈泳先, 陈晓汉, 蒋伟明, 等. 饵料营养对亲虾繁殖性能及幼体质量影响研究进展[J]. 南方农业学报, 2011, 42(6): 676-679. 吴旭干, 成永旭, 常国亮, 等.亲本强化培育对中华绒螯蟹雌体生殖性能和Z1幼体质量的影响[J].水产学报, 2007, 31(6): 757-764. 王维娜, 王安利, 胡俊荣, 等. 水中饵料生物的种类和数量对虾蟹繁育率的影响[J]. 河北大学学报(自然科学版), 2000, 20(4): 405-409. 田宝军, 李英文, 丁茜, 等. 轮虫与卤虫在营养价值等方面的比较[J]. 河北渔业, 2007(12): 45-47. LÉGER P, BIEBER G F, SORGELOOS P. International study on Artemia, XXXⅢ. Promising results in larval rearing of Penaeus stylirostris using a prepared diet as algal substitute and for Artemia enrichment[J]. Journal of the World Aquaculture Society, 1985, 16(1/4): 354-367. 林琼武, 王桂忠, 李少菁. 饵料对锯缘青蟹大眼幼体生长发育的影响[J]. 台湾海峡, 2001, 20(s1): 16-22. LIN Q W, WANG G Z, LI S J. Effects of diets on growth and development of megalopa of mud crab Scylla serrata[J]. Journal of Oceanography in Taiwan Strait, 2001, 20(s1): 16-22. 刘子琳, 越川海, 宁修仁, 等. 长江冲淡水区细菌生产力研究[J]. 海洋学报, 2001, 23(4): 93-99. 成永旭, 王武, 李应森. 河蟹的人工繁殖和育苗技术[J]. 水产科技情报, 2007, 34(2): 73-75. 吴艳庆, 张玉祥, 杜荣斌, 等. 不同规格和投苗密度对仿刺参池塘网箱保苗效果的影响[J]. 水产科学, 2016, 35(6): 633-638. WU Y Q, ZHANG Y X, DU R B, et al. Effects of different size and density on intermediate seedling culture of sea cucumber, Aostichopus japonicus in net cages disposed in earthen ponds[J]. Fisheries Science, 2016, 35(6): 633-638. 陈欣然, 牛翠娟, 蒲丽君. 水产动物密度胁迫研究进展[J]. 中国水产科学, 2007, 14(7): 138-146. CHEN X R, NIU C J, PU L J. Effects of stocking density stress on aquatic animals:a review[J]. Journal of Fishery Sciences of China, 2007, 14(7): 138-146. 徐如卫, 江锦坡, 陆开宏, 等. 河蟹性早熟原因的初步研究[J]. 浙江海洋学院学报(自然科学版), 2001, 20(3): 195-198. 何杰, 吴旭干, 龙晓文, 等. 长江水系中华绒螯蟹野生和养殖群体选育子一代养殖性能和性腺发育的比较[J]. 海洋与湖沼, 2015, 46(4): 808-818. HE J, WU X G, LONG X W, et al. Culture performance and gonadal development of the first generation of selectively-bred Chinese mitten crabs from wild and cultured populations[J]. Oceanologia et Limnologia Sinica, 2015, 46(4): 808-818. 李云峰, 康现江, 赵晓瑜, 等. 河蟹性早熟发生的相关内在因素研究进展[J]. 水产科学, 2005, 24(2): 34-36. Abstract: The research was aimed to compare the growth performance of wild megalopae (G0) and the offspring of wild broodstock (G1) of E. sinensis during the juvenile culture stage based on a culture experiment. The comparison and differences of body mass, survival rate, precocious rate, and the final yield are shown as follows:(1) No matter for females or males, the average mass of wild G0 was consistently lower than that of wild G1 individuals throughout the culture period with significant differences at 120-day and 150-day old of females (P < 0.05); (2) The weight gain rate (WGR) and specific growth rage (SGR) of both populations were on the decline and they were generally higher in G1 individuals all through the culture stage except for the 150-180 and 180-210 days old. (3) The survival, yield and precocious rate of wild G0 were relatively higher than those of wild G1 individuals; (4) As for the size distribution of juvenile crabs, the body mass of wild G1 were mainly concentrated on the ranges of 0-4.00 g (36.76%), but the wild G1 were mainly concentrated on 4.00-5.99 g (26.93%) and 6.00-7.99 g (25.43%), the percentage large-size juveniles (≥ 12 g) were all low for both populations, only 8.46% and 7.60%. 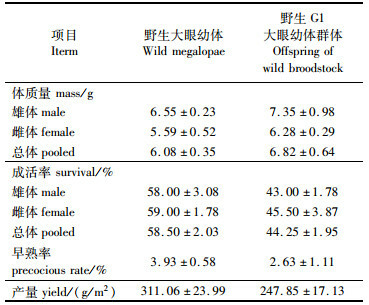 Wild megalopae were superior to the offspring of wild E. sinensis on survival rate and yield, and difference in nutritional value or immunity of both populations still needs further research.Through the culture experiment, the breeding effects of wild megalopae from two different sources in the juvenile culture stage were compared, which provided a practical basis for rational breeding and utilization of wild megalopae.